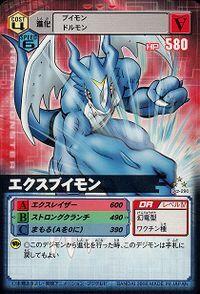 An Adult-level Mythical Dragon Digimon that attained V-mon's natural power and evolved. 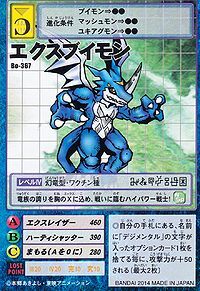 XV-mon is a purebreed of V-dramon, and it is said that the variant species is V-dramon. 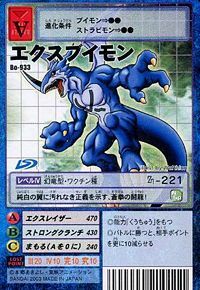 The attacks it unleashes using its developed arm and leg strength are tremendous, and are powerful enough to destroy a mountain of rock without leaving a trace. It is feared because it possesses such destructive power, but in reality, it has a strong sense of justice, and will not use that power recklessly. Its Signature Move is a powerful biting technique (Strong Crunch). Its Special Move is an energy wave emitted from the "X" pattern on its chest (X-Laser). 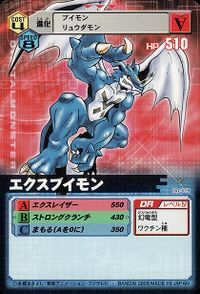 An Adult-level Mythical Dragon Digimon that attained V-mon's natural power and evolved. 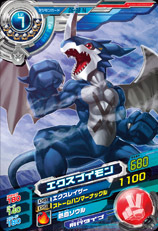 XV-mon is a purebreed of V-dramon. The attacks it unleashes through its developed arm and leg strength are tremendous, and are powerful enough to destroy a mountain of rock without leaving a trace. It is feared because it possesses such destructive power, but in reality, it has a strong sense of justice, and will not use that power recklessly. Its Signature Move is a powerful biting technique (Strong Crunch). 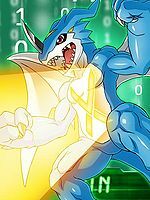 Its Special Move is an energy wave emitted from the "X" pattern on its chest (X-Laser). | XV 「エクスブイ Ekusubui」 originates from the XV-shaped mark on its chest. Anime/Manga Digimon Adventure 02: "Brave Evolution! 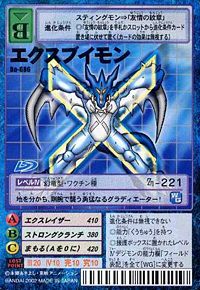 XV-mon"
X-Laser  エクスレイザー Ekusu Reizā Vee Laser/Ex-Laser Shoots an intense laser beam in the shape of an X from its chest towards the adversary. Strong Crunch  ストロングクランチ Sutorongu Kuranchi Critical Crunch/Power Crunch Jumps up towards the enemy inflicting a powerful bite on them. Hearty Shatter  ハーティシャッター Hāti Shattā Heart Breaker Shoots a ball of fire while jumping or rams the enemy, shoulder-first, from the skies. 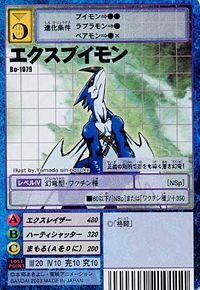 First appeared in Digimon Adventure 02 - Episode 22. XV-mon is the partner Digimon of Motomiya Daisuke. He evolved from V-mon to protect his partner from Tortamon. Evolves from V-mon at level 21. Evolves to Paildramon at level 31. 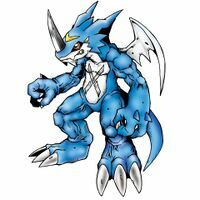 XV-mon is an obtainable partner Digimon. Can be evolved from V-mon if above level 19. 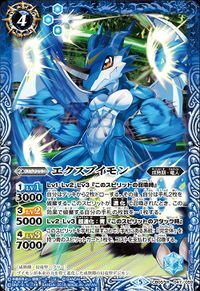 He can evolve to Paildramon if above level 30 and Dragon EXP above 5000, or Fladramon if above level 30 and needs to be holding the Digimental of Courage, or Magnamon if above level 30 and needs to be holding the Digimental of Miracles. 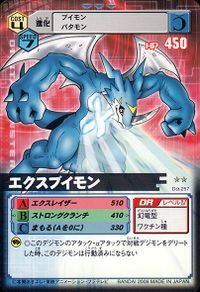 Can be evolved from V-mon if above level 23, attack 120, and spirit 115. May evolve from V-mon at level 11. Evolves to Paildramon at level 25. 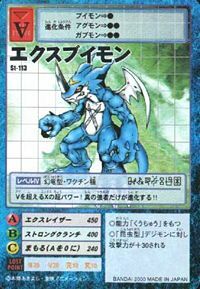 XV-mon can only be obtained as a collectible card. 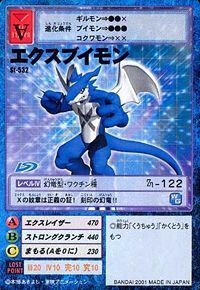 Its card is part of the V-mon Evolution (ブイモン進化 Buimon Shinka) set. 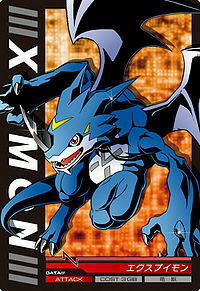 XV-mon is the main evolution of V-mon, one of the twelve playable characters. It can also be obtained as a collectible DigiCard. 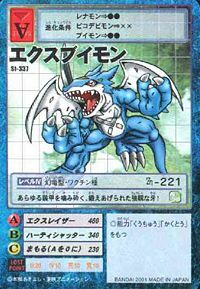 Evolves from V-mon, one of the playable Partner Digimon and evolves to Paildramon when Jogressed with Stingmon. 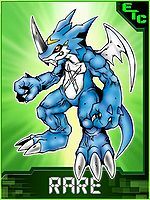 Can also evolve to Dinobeemon if Jogressed with Stingmon. Evolves from Agumon, Guilmon, or V-mon. 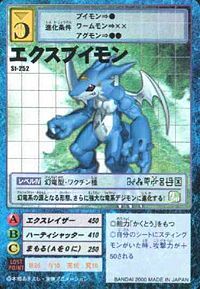 Can evolve to Aero V-dramon, Megalo Growmon, Metal Greymon, or Metal Tyranomon. 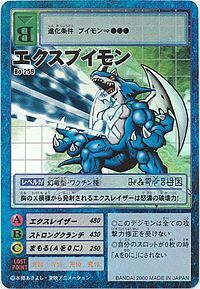 Can also Jogress with Tyranomon (1.0), Angemon (2.0), or Dobermon (3.0) to evolve into Megadramon, or Jogress with Stingmon (D-Scanner 1.0) to evolve into Paildramon. The super strength of X is stronger than V! Only the strongest can evolve into it!! Its arms and legs have grown stronger, and it wields its fist for the sake of justice! The original form of the Mythical Dragons. It can evolve to even stronger dragon type Digimon! Its strong tempered fangs can crunch any armor! The 'X' emblem is proof of justice! An engraved Mythical Dragon!! The X Laser that shoots from the X pattern on its chest is as strong as a tidal wave! 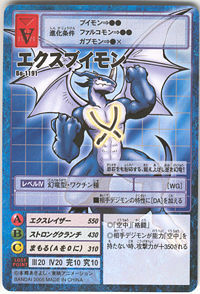 With the pride of the dragons carved into the X on its chest, this high-powered warrior descends onto the battlefield! This fearless gladiator splits the earth with a strike from its powerful arms! 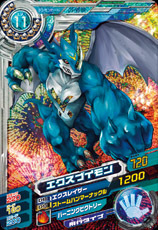 This blue-fisted fighting dragon's snow white wings represent untainted justice! 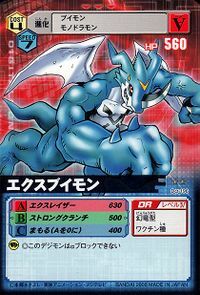 This blue mythical dragon crushes even boulders with its strong arms of justice! 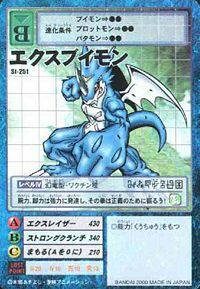 This highly-trained, blue mythical dragon pulverizes even rocks! 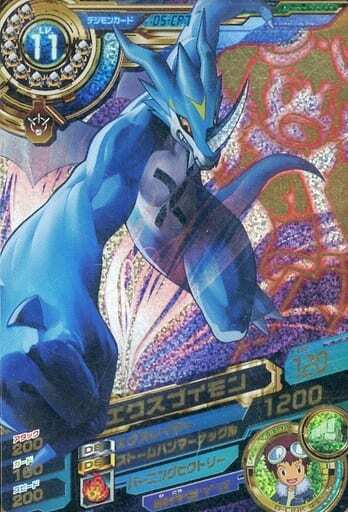 Although its well-developed arms are powerful enough to destroy giant boulders without leaving a trace, it has a strong sense of justice and will not abuse its powers without good reason. The partner of Motomiya Daisuke, a Chosen Child. It fires its X-Laser from the X-shaped marking carved onto its abdomen. 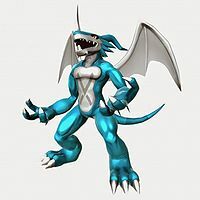 A Mythical Dragon Digimon said to have existed since ancient times. Its defining characteristics are its sturdy horn and the X-shaped marking on its chest. 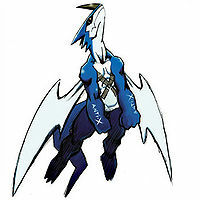 V-mon's evolved form, after it had attained its original powers. Its four limbs have grown and now possess higher attack power, such that it is now able to smash even mountain-sized boulders without leaving a trace. 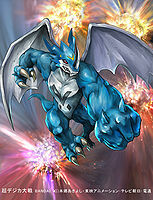 V-dramon is a variant species of XV-mon.